Of all the mystical treatises of ancient Indian literature, the Avadhut Gita, or "Song of The Avadhut," is one of the most eloquent and compelling. Its theme is the unitive knowledge obtained through mystical vision, the knowledge of the eternal self. This knowledge is not limited to the mystics of any one cultural tradition, but is universal among all those who have attained to mystical vision. Men and women of all lands and all religious persuasions have experienced first-hand the eternal Reality, and realized it to be their own essential identity. Some of the best known representatives of this universal knowledge are the Upanishadic rishis and Shankaracharya of the Vedantic tradition, al-Hallaj and Jalaluddin Rumi of the Sufi tradition, Shakyamuni and Ashvagosha of the Buddhist tradition, and Meister Eckhart and Juan de la Cruz of the Christian tradition. All have expressed the revealed knowledge of their identity with the one eternal Reality, and declared, in one way or another, their agreement with the words of the Christian saint, Catherine of Genoa, "My Me is God, nor do I recognize any other Me except my God Himself." Throughout history, it has been the contention of the mystics of all cultural traditions that the "vision of God" reveals man's essential oneness with Absolute Being, awakening him to his true, eternal identity. Prior to such divine illumination, say these mystics, man suffers under the mistaken illusion that he is a limited and finite being, separate and distinct from other beings, who possesses his own individual identity. The dispelling of this illusion is called in different mystical traditions by different names, such as "enlightenment," "union with God," "liberation," "salvation," etc. ; it is, despite the various names, the same experience, the same knowledge that is revealed to all who have obtained the mystical vision. Previous to the revelation of our absolute identity, we live in confident certainty of our (illusory) individuality, regarding as "self" that kaleidoscope of transient mental impressions which is presented to our conscious awareness. But, say the mystics, this superficial play of thoughts, memories, sense impressions, upon the screen of awareness is but a mirage. It is the screen, the awareness itself, that is our true identity. It is that unchanging consciousness, the eternal witness of all movements of thought and appearance, which is who we really are. It is That which is our real, our only, Self. The Song of the Avadhut is one of the most sublime and uncompromising statements of this mystically perceived truth ever penned. 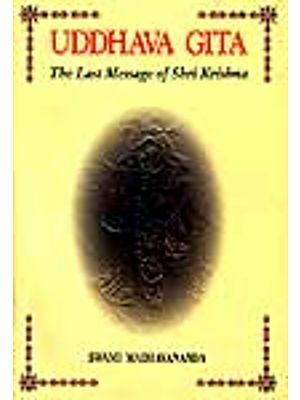 Certainly, it is of Indian origin and is in the tradition of the Upanishads, the Bhagavad Gita, the writings of Shankaracharya, and all those other scriptural treatises of India which may be classified as "Non-Dualistic Vedanta"; but it is an error to regard it as merely the expression of a particular philosophical school or religious faith. Its similitude to all those Non-Dualistic treatises preceding it is dependent, not upon a common learned tradition, but upon a common direct experience. The author of the Avadhut Gita was enlightened by the same direct revelation which inspired the Upanishads, the Bhagavad Gita, and other such works. It must be read, therefore, not as the reiteration of a conceptual position, or as argument for the Vedantic viewpoint, or as an argument for the Vedantic viewpoint, but as the sharing by an illumined sage of directly revealed truth. His aim in this sharing is not to convince us, but to awaken us to the truth, and liberate us from error. The Avadhut Gita is a call to knowledge, the supreme knowledge of ultimate Truth. The Avadhut holds out no compromise with illusion, he offers no foothold on separation, he allows no semblance of duality at all to creep into our perception of reality. Perhaps his knowledge is, for mere man, too sublime, too austere, too simplistic; but it is the knowledge of the ultimate, indisputable Truth of existence; and it is this very Truth which has the power to make us free. The author of the Avadhut Gita was most certainly a Self-realized yogi and a master of Sanskrit verse; beyond that, we know very little. His Song has had many forerunners and many reaffirmations over the centuries; yet, of all the many such declarations of the knowledge of the one Self, none is more eloquent and compelling, none more convincing and illuminating, than this. Whoever the author of the Avadhut's Song might have been, there is no doubt that he was a great teacher, one truly established in the certainty of his supreme identity. It is not only the profundity and genuineness of his vision, but the poetic beauty of his Song as well that has made it a source of joy and inspiration to his grateful readers over the years. 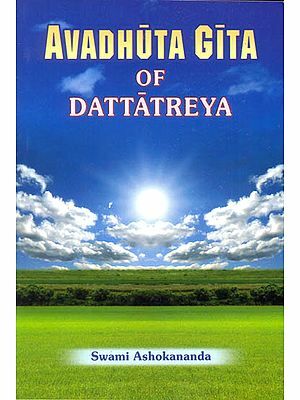 The author of the Avadhut Gita does not refer to himself by name, but at the end of each chapter, we are told that it was written by Sri Dattatreya. It is probable that this attribution is a later accretion, added to lend weight and credence to the utterances therein, and to insure their promulgation. The legendary Dattatreya of ancient mythology was said to have been an incarnation of Vishnu, born to the sage, Atri and his chaste wife, Anasuya; but as to whether such a person actually lived and what were the factual details of his life we know nothing at all. According to legend, he received the epithet of "Avadhut" when he renounced his royal heritage to become a wandering ascetic, living naked and free, far from the distractions of worldly men. The word, Avadhut, has become a generic term for all those homeless ascetics and yogis of India who live the life of total renunciation, unconcerned with the world and its "civilized" conventions, in order to remain concentrated on and identified with the eternal Self. The actual date of authorship of the Avadhut Gita is unknown, but, judging by its terminology and style, it appears to have been written, not in the millennia prior to the Current Era, as legend would have it, but sometime around the 9th or 10th centuries of our Current Era. This does not, of course, preclude the possibility of an oral transmission to that point in time. Its theme is the same as that of the Upanishads, the Bhagavad Gita, and the writings of all illumined seers: the Self. It speaks, not of the soul or of God, but speaks rather from the experiential awareness in which that subject-object relationship no longer exists. 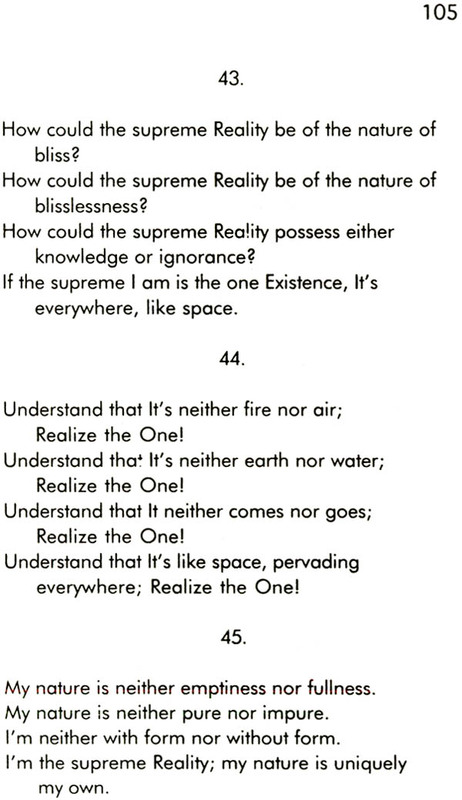 It is a song of the final, ultimate, and irreducible Reality realized as! While his outlook is non-sectarian and iconoclastic, he frequently uses such terms as "Shiva," "Brahman," and "Purusha" to represent the absolute Self; but he uses these terms only to demonstrate their inadequacy. His intention is to demolish all sense of duality arising from the concept of a "God" separate from one's own Self, one's own essential Being. His outlook is identical, in fact, with that of the great Shankaracharya, who lived around the same period. Indeed, the Avadhut's Song is virtually indistinguishable from some of the writings of the illustrious Acharya. Both sang of the need to recognize Brahman-Shiva-Purusha as the Atman, or Self; both asserted that the final spiritual attainment was identification with the Absolute, recognizing no other deity but the eternal. Dualistic devotion might indeed lead one to knowledge of the Self, but from that point on, it becomes necessary to abandon all illusory dualities, and to become established in the awareness, aham brahmasmi ("I am Brahman") or shivoham ("I am Shiva"). To be sure, few men are capable of reaching such heights of knowledge, and fewer still are capable of sustained endurance in the rarified atmosphere at such altitudes of awareness. For this reason, a guide such as the Avadhut is most necessary and comforting to us. He leads us, confidently upward, over the rugged terrain of thought, and into the remote realms of unconditioned awareness. As we follow him into the dizzying heights of unitive knowledge, we are privileged to share in some measure his exalted state. Reading only a few verses of the Avadhut's Song, our minds are immediately lifted to a realm of immeasurable calm and certainty. A few more verses, and we've become immoveable, invincible, unruffled, secure once more in the recalled knowledge of our own eternal Self, which, somehow, we had forgotten. 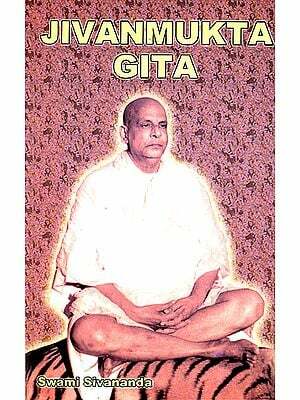 Thus, simply by reading the words of this master guide, we are lifted into the freedom and exultation of his pure awareness, and mode capable of fasting a little of the sweet nectar of our own intrinsic bliss. The author of the Avadhut Gita expressed his thought in an extremely compacted from, utilizing several very brief and concise poetic metres. The meaning of the verses is therefore so condensed that the reader or translator is required, in many instances, to supply for himself the meat of the meaning to the bare bones which are provided. For this reason, a number of quite differently interpreted Sanskrit text. In attempting a translation of this work, therefore, a certain familiarity with the thought of the Avadhut, and his state of awareness, is a greater asset than a purely linguistic competance. I have attempted, in my own translation of this work, text, while at the same time taking certain liberties in order to bring out the full intent of the author's words. Moreover, I have assumed the burden of retaining as much as possible the poetic and rhythmic form of the original. My own translation is therefore also very compressed, requiring some additional elucidation of the text to be appended in the Notes. But I have aimed throughout to provide a readable English facsimile of the original, with as little dependence on extraneous notation as possible. 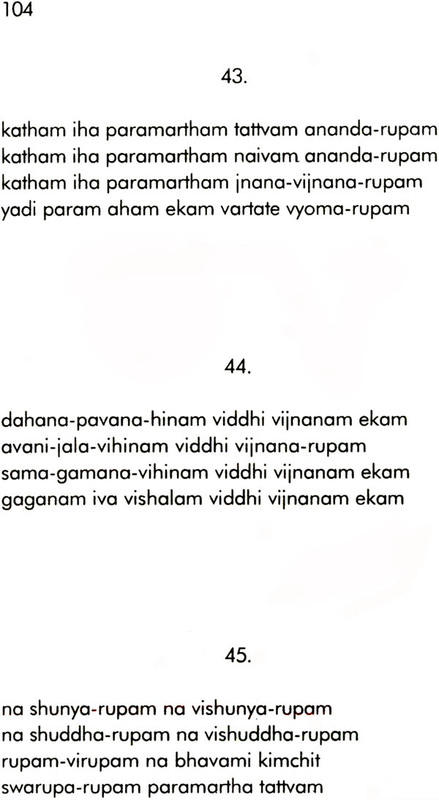 I have included the original transliterated Sanskrit on pages facing the English translation as a reference for the casual student of Sanskrit terminology; but even those with no familiarity with Sanskrit will find it interesting and fascinating, I think, to read aloud the transliterated Sanskrit for its exquisite evenness of poetic rhythms and its hypnotic symphony of sounds. Even without a knowledge of their meaning, one can sense from a reading of these Sanskrit verses, the almost superhuman poetic genius of their author, and the powerful audial effect of the work as a whole. "Of all the mystical treatises of ancient Indian literature, The Avadhut Gita, or "Song of the Avadhut," is one of the most eloquent and compelling. Its theme is the unitive knowledge obtained through mystical vision, the knowledge of the eternal Self. This knowledge is not limited to the mystics of any one cultural tradition, but is universal among all those who have attained to mystical vision. 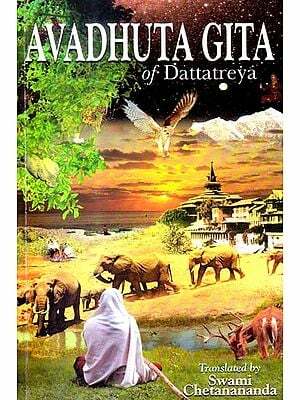 "The author is The Avadihut Gita was enlightened by the same direct revelation which inspired the Upanishads, the Bhagavad Gita, and other such works. It must be read, therefore, not as the reiteration of a conceptual position, or as an argument for the Vedantic viewpoint, but as the sharing by an illumined sage of directly revealed truth. His aim in this sharing is not to convince us, but to awaken us to the truth, and liberate us from error. "The Avadhut Gita is a call to knowledge, the supreme knowledge of ultimate truth. The Avadhut holds out no compromise with illusion, he offers no foothold on separation, he allows no semblance of duality at all to creep into our perception of reality. Perhaps has knowledge is, for mere men, too sublime, too austere, too simplistic; but it is the knowledge of the ultimate indisputable Truth of existence; and it is this very Truth which has the power to make us free."